Give users control over their measurements. Save your data once and display it in multiple units on-the-fly. All instances of the selected unit are instantly updated and saved. 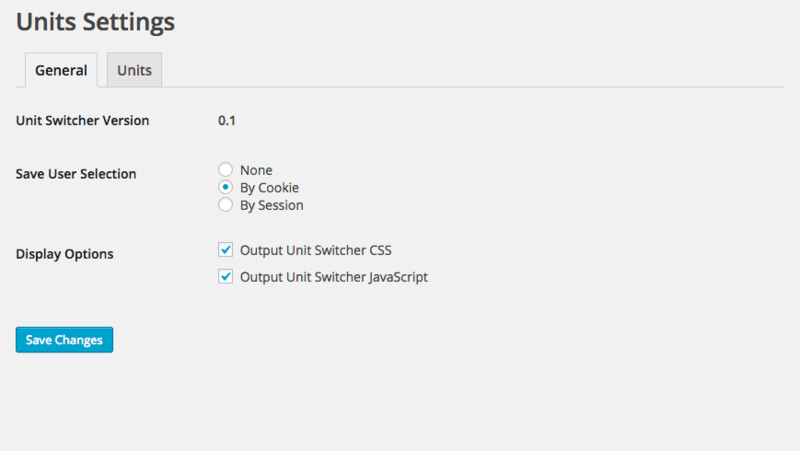 *Selections are saved – try refreshing your page after changing a unit. Units is a WordPress plugin designed for theme developers. Its primary function is to provide front-end users with a quick way to customize their preferred units of measurement, while storing only one value in the database. Units requires PHP version 5.3.2 or above, and WordPress version 3.8 or above. The plugin will not install on setups that do not meet the minimum requirements. Any number of units may be added under Settings > Units. The primary unit is the “parent”, and the unit that database values should be stored in. To add a primary unit, click the “+” button to the far right of the unit box. Alternate units will be available choices to convert from the primary unit. All fields are required when adding primary and alternate units: the unit name (plural), the unit singular name, and conversion formula. As an example, if the primary unit is set in feet, and an alternate unit of inches is added, the formula would be saved as X*12. Add as many units/alternate units as needed. To display the unit dropdown within a theme file, you may do so using a function call. The function and its available parameters are outlined below. (string) (required) The stored unit value. Numbers should be stored in the primary unit value. (string) (required) The primary unit the value is stored as. (int) (optional) Number of decimal places to round the numbers to. In the following example, we’ll use a length stored using an advanced custom field with a value of 12 and field name as ‘length’. In our case, the primary unit is feet. Options include none, session, & cookie. Defaults to none. 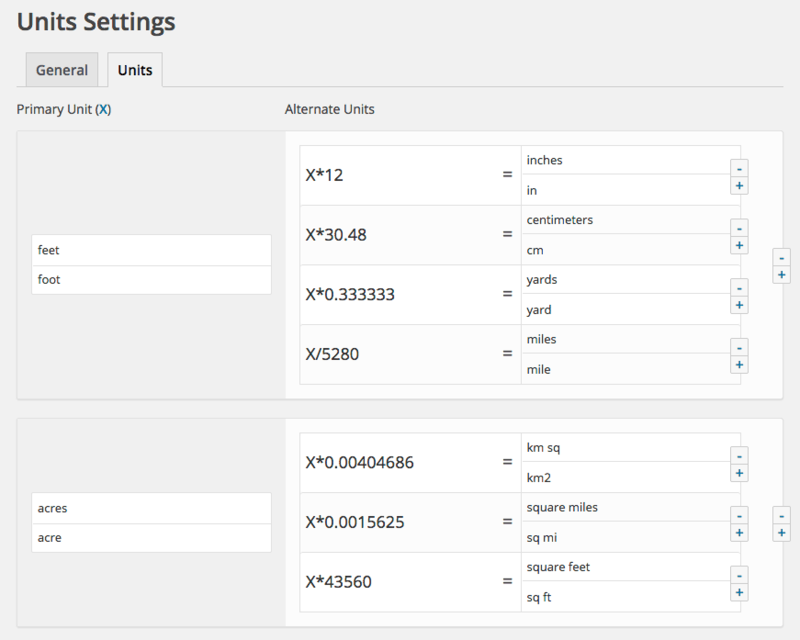 The plugin uses the Bootstrap Dropdown jQuery plugin for dropdown functionality. If you are already using this plugin in your theme, you may omit this. Does this plugin work with WPML? Not currently. There are plans to add WPML compatibility. If you are a polygot and would like to include a translation, submit a pull request in the Github project or send a message in the support form below. Use the form below to submit a request for support or request a new feature. ©2019. Units for Wordpress is created and maintained by Kyle Phillips.